This is a legally binding liability release, waiver, discharge and covenant not to sue (the “Release”), made by me, the undersigned, to Kumite Classic Entertainment Corp.
hereby release Kumite Classic Entertainment Corp., and any and all other persons associated with this event in any capacity, from any and all liability due to injuries that I may incur as a result of my attendance and / or participation at this event. Furthermore, I hereby waive any compensation whatsoever for the use of pictures or video production of myself, utilized by those associated with this event, for any promotional use or profit-making at anytime. I agree to indemnify, defend and hold harmless all the above named parties from any liability or compensation. Additionally, I am fully aware of my personal medical condition and hereby certify that I am mentally and physically fit perform at the Kumite Classic. In consideration of my application and permitting me to participate in this event, I hereby take action for myself, my executors, administrators, heirs, next of kin, successors, and assigns as follows: (A) Waive, Release and Discharge from any and all liability for my death, disability, personal injury, property damage, property theft or actions of any kind which may hereafter accrue to me including my traveling to and from this event, Kumite Classic Entertainment Corp., and their directors, officers, employees, volunteers, representatives, and agents, the event holders, event sponsors, event directors, event volunteers; (B) Indemnify and Hold Harmless the entities or persons mentioned in this paragraph from any and all liabilities or claims made as a result of participation in this event, whether caused by the negligence of releases or otherwise. I hereby consent to receive medical treatment, which may be deemed advisable in the event of injury, accident and or illness during this event. This Accident Waiver and Release of Liability shall be construed broadly to provide a release and waiver to the maximum extent permissible under applicable law. I agree to be photographed, recorded and videotaped by Kumite Classic Entertainment Corp. and its agents (“Company”) in connection with my participation in Kumite Classic. I hereby irrevocably authorize Kumite Classic Entertainment Corp. and its affiliates to copyright, publish, reproduce, exhibit, transmit, broadcast, televise, digitize, display, otherwise use, and permit others to use, (a) my name, image, likeness, and voice, and (b) all photographs, recordings, videotapes, audiovisual materials, writings, statements, and quotations of or by myself (collectively, the “Materials”), in any manner, form, or format whatsoever now or hereinafter created, including on the Internet, and for any purpose, including, but not limited to, advertising or promotion of Company, its affiliates, or their services, without further consent from or payment to me. It is understood that all of the Materials, and all films, audiotapes, videotapes, reproductions, media, plates, negatives, photocopies, and electronic and digital copies of the Materials, are the sole property of Kumite Classic Entertainment Corp. 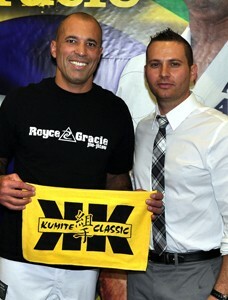 I agree not to contest the rights or authority granted to Kumite Classic hereunder. I hereby forever release and discharge Kumite Classic Entertainment Corp., its employees, licensees, agents, successors, and assigns from any claims, actions, damages, liabilities, costs, or demands whatsoever arising by reason of defamation, invasion of privacy, right of publicity, copyright infringement, or any other personal or property rights from or related to any use of the Materials. I understand that Kumite Classic Entertainment is under no obligation to use the Materials. I acknowledge that this waiver and release of liability form will be used by the event holders, sponsors and organizers, in which I may participate and that it will govern my actions and responsibilities at said events. I hereby certify that I have read this document, understand and agree to comply with its contents. Please print a copy of this form and bring it with you to the Monroeville Convention Center box office for admission. Upon approval of your application, a representative of Kumite Classic will contact you about further details. Thank you for your submission.